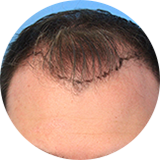 You can be a big part of the success of your hair transplant by following the instructions provided by us for both before hair transplant and after hair transplant. The instructions are provided to help make sure your hair transplant experience goes smoothly. Many patients who receive a hair transplant are on medications for their other medical conditions. Dr. Mohebi usually reviews them during your initial consultation and makes comments on the ones that require special attention around the time of your procedure. If your medical condition changes between the time of your initial consultation and the day of your procedure resulting in you being prescribed new medications, you need to discuss them with Dr. Mohebi immediately. Aspirin and aspirin-like medications (commonly called NSAIDs) make people bleed more during a hair transplant and tend to slow down the procedure. You need to discuss with your prescribing doctor about replacing them with other medications that do not increase your bleeding (such as Tylenol). Please do not stop taking your prescribed medicine without discussing with your doctor! Do I Need a Certain Haircut? The answer to the above question is “yes and no”. If you want to keep your hair long and avoid shaving your head or showing any sign of the procedure, you may need a certain haircut before your procedure. This can be discussed with the doctor the day of your consultation. If you don’t have a certain style preference, leave it as long as possible and our team will trim and mildly style your hair before or after the procedure (if necessary). If you are not sure what to do with your hair, still keep it as long as possible and we’ll discuss your haircut options the day of the procedure. Keeping your hair long allows our team to do layer-shaving or trimming on the donor area for FUE or strip procedures. Layer-shaving allows the trimmed area to be covered with the rest of your scalp hair and keeps your procedure less detectable. How do I Wash my Hair Before my Procedure? Taking care of washing your hair the day of your hair transplant is easy. All you need to do the day of your procedure is wash your hair normally with warm water and with your normal shampoo. Be sure not to use any conditioning products. Also, please do not use any gels or other styling products the day of your hair transplant procedure. Toppik or similar microfibers products should not be used for a few days before your transplant. We would like to wash your hair for the first time after your hair transplant and we will send a list of instructions home with you following the procedure to help you properly wash your hair post-transplant. Will I Need to Perform Scalp Exercises? Patients who receive FUE hair transplant do not need scalp exercise. Scalp exercise might be necessary for some patients who receive a strip FUT procedure. People who need it are usually the one who require a large number of grafts or the ones with a very tight scalp. Dr. Mohebi usually checks your scalp laxity with a Laxometer and discusses this with you during your initial consultation if need be. If scalp exercises are recommended, it is very important that you perform these assigned scalp exercises prior to your hair restoration procedure. By increasing the skin laxity through scalp exercise on the back of the head, the size of the donor strip can be easily increased. In turn, this allows more hair grafts to be harvested and transplanted in one procedure while it also may allow for minimal stretching of the donor scar. Why is it Important to Follow These Instructions? Our first priority is to our patients. As such, we try and make the hair transplant experience as smooth as possible for you. By successfully completing the instructions leading up to your procedure, your procedure and subsequent recovery time will be both a stress free and pleasant experience for you.